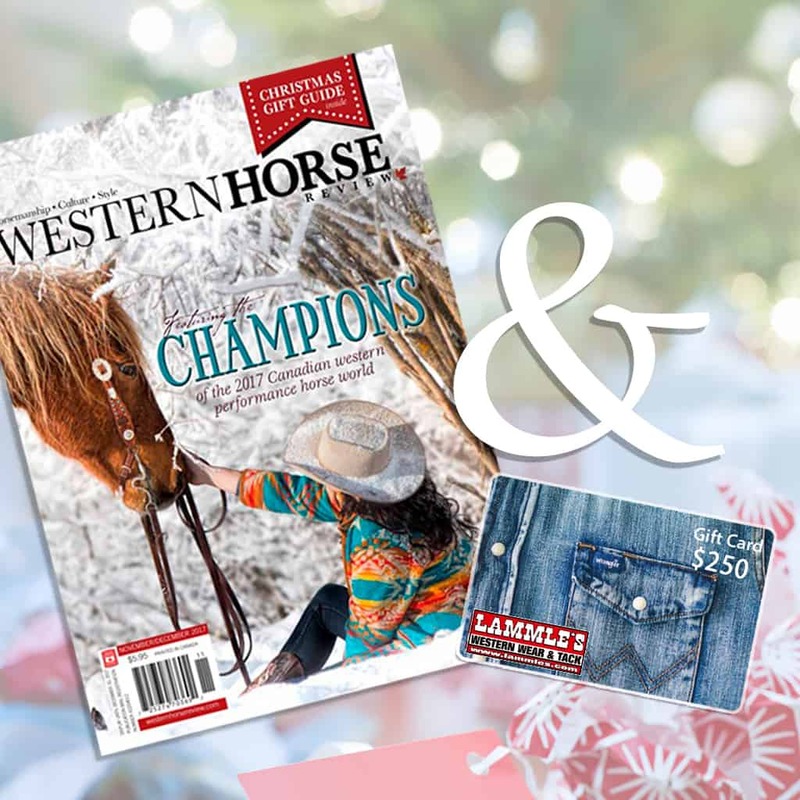 Western Horse Review and Lammle’s Western Wear is proud to present our Holidays Giveaway for a $250 Gift Card and Magazine Subscription Sweepstakes. For a chance to win visit the Western Horse Review Facebook page and read the rules below. No purchase is necessary to enter. 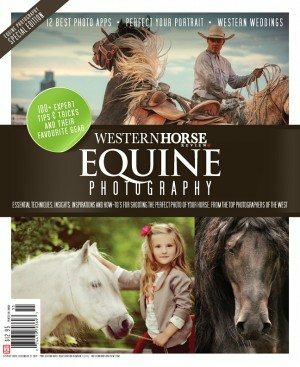 To enter the $250 gift card and magazine subscription Sweepstakes (the “Contest”), entrant must ‘like’ and ‘tag’ a friend on the Facebook contest post (“https://www.facebook.com/Lammles/“) or (“https://www.facebook.com/WesternHorseReview/”) and be following the Lammle’s and Western Horse Review Facebook Page. The Contest commences on Monday, December 21st, 2017 at 4:00 PM MST and closes at 9:00 PM MST, December 31st, 2017 (the “Contest Closing Time”). All entries that are incomplete, irregular, have been submitted through illicit means, or do not conform to or satisfy any condition of these Contest rules and regulations may be disqualified. 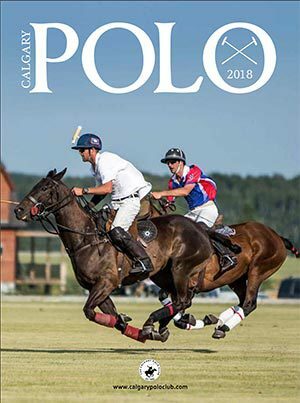 Lammle’s Western Wear & Tack & West & Western Horse Review, (The “Sponsors”) is not responsible for any lost, delayed, illegible, incomplete, misdirected, damaged, or destroyed entries. The Contest is open to legal residents of Canada (except residents of Quebec), who have reached the age of majority in the jurisdiction in which they reside at the time of entry. Employees, officers, and directors (including immediate family members and members of the same household) of Lammle’s Western Wear & Tack and Western Horse Review and their respective distributors, dealers, marketing representatives, printers, advertising or promotional agencies, or any other organization associated with the Contest are not eligible to participate. 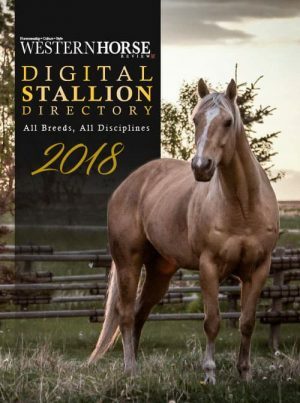 (1) Grand Prize will be awarded each consisting of (1) 2 year subscription to Western Horse Review Magazine, valued at $39.95 and (1) $250 Gift Card to Lammle’s Western Wear and Tack valued at $250.00. The Sponsors reserve the right to substitute a prize in whole or in part for a prize of equal or greater value in the event that any component of the Prize is unavailable for any reason. The Prize must be accepted as awarded and no substitutions, except as identified above, will be made. Prizes may not be sold, transferred or assigned and are not convertible to cash. The prize is only valid in store at any Lammle’s location. The odds of winning depend on the number of eligible entries. Winners will be chosen by 4:00 pm PST on January 2nd, 2018 at the Lammle’s Western Wear & Tack Head Office location in Calgary, Alberta. The Sponsors will attempt to notify the selected entrants by email and/or Facebook messaging within 24 hours of the draw. In order to be declared a winner, the selected entrant must, unaided, correctly answer a time-limited skill-testing question and, within one (1) day, the selected entrant must complete and return to Lammle’s Western Wear & Tack a contest eligibility and liability/publicity release confirming compliance with these rules and regulations, releasing the Sponsors and their respective directors, officers and agents from all liability and, except where prohibited by law, permitting the Sponsors to use the selected entrant’s name, address (city and province) and image, without compensation, worldwide and in perpetuity, in any and all forms of media now known or hereafter devised, including the Internet, in any publicity carried out by the Sponsors. In the event that a selected entrant is not eligible for any reason, has not correctly answered the skill-testing question or cannot be contacted after two (2) business days of the first attempt to contact the selected entrant, such entrant shall be disqualified and the Sponsors shall have the right to select another entrant and the Sponsors shall be released and discharged from any liability or responsibility in this regard. No correspondence will be made except with the selected entrants. By entering the Contest, entrants agree to abide by these rules and regulations, and further agree that the decisions of the Sponsors are final. The Sponsors reserve the right at any time without prior notice to withdraw, cancel, terminate, amend, modify or suspend the Contest if for any reason in the opinion of the Sponsors, in their sole discretion, the Contest is not capable of operating as planned or if the administration, security, fairness, integrity, or proper conduct of the Contest is corrupted or adversely affected, including by reason of infection by computer virus, bugs, tampering, unauthorized intervention, fraud, technical failures, or any other causes beyond their control. The Sponsors reserve the right in their sole discretion to disqualify any individual they find to be tampering with the operation of the Contest or to be acting in violation of these rules or otherwise in disruptive manner with respect to the Contest. CAUTION: ANY ATTEMPT BY A CONTESTANT TO DELIBERATELY DAMAGE ANY WEBSITE OR UNDERMINE THE LEGITIMATE OPERATION OF THE CONTEST IS A VIOLATION OF CRIMINAL AND CIVIL LAWS AND SHOULD SUCH AN ATTEMPT BE MADE, THE SPONSORS RESERVE THE RIGHT TO SEEK DAMAGES FROM ANY SUCH ENTRANT TO THE FULLEST EXTENT PERMITTED BY LAW. The Sponsors also reserve the right to cancel this contest at any time because of any printing or other error. The Sponsors do not assume any responsibility for technical malfunctions, human or technical error, seeding or printing errors, lost, delayed or garbled data or transmissions, omission, interruption, deletion, defect or failures of any telephone or computer line or network, computer equipment, software (including on account of traffic congestion on the Internet or at any Web site) or any combination thereof. The Sponsors shall not be liable for any errors or negligence that may arise or occur in connection with the Contest, including any injury or damage to the entrant’s or any other person’s computer related to or resulting from participation in or downloading of any materials relating to the Contest. The Sponsors are not liable for injuries, death, damages or losses of any kind resulting from acceptance or use of the Prizes. 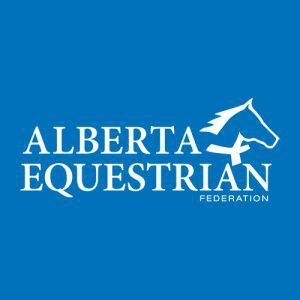 This Contest is subject to all applicable federal, provincial and municipal laws and regulations and is void where prohibited.